In May 2017, SPACES researchers received additional impact funding from ESPA to share the project’s knowledge assets. The funding was used to develop SPACES Data Explorer. The idea springs from suggestions that the stakeholders gave in pilot interviews, about sharing findings with graphs and making it more user friendly. The Data Explorer democratizes SPACES data on basic needs, ecosystem services, and wellbeing and makes it accessible for a wider audience beyond academia. The methods used to collect the basic needs data is described in the publication by Chaigneau et al (2018), see here for more information. The Data Explorer was presented during Western Indian Ocean Marine Science Association (WIOMSA) Symposium in November, where SPACES co-hosted a full day special session with ESPA. It was then shared in 1-1 follow-up meetings with key stakeholders in Kenya and in Mozambique. Click here to view the Data Explorer. On the first page of the Data Explorer, you can read about the different datasets and what information is displayed. This is also where you will choose the site or sites you wish to explore on the left handside of the screen. Remember to click Go To Charts! The first chart that you will come to displays the basic needs that are not met in the site or sites that you have chosen. You can hover over the bars to see the definitions of the basic needs. Next you can choose to view what impact ecosystem services have on the basic needs. The bar heights will not change, but the colours will. Here it is important to focus on the colours rather than height. Dark green represents an ecosystem service that has high impact on the basic need. 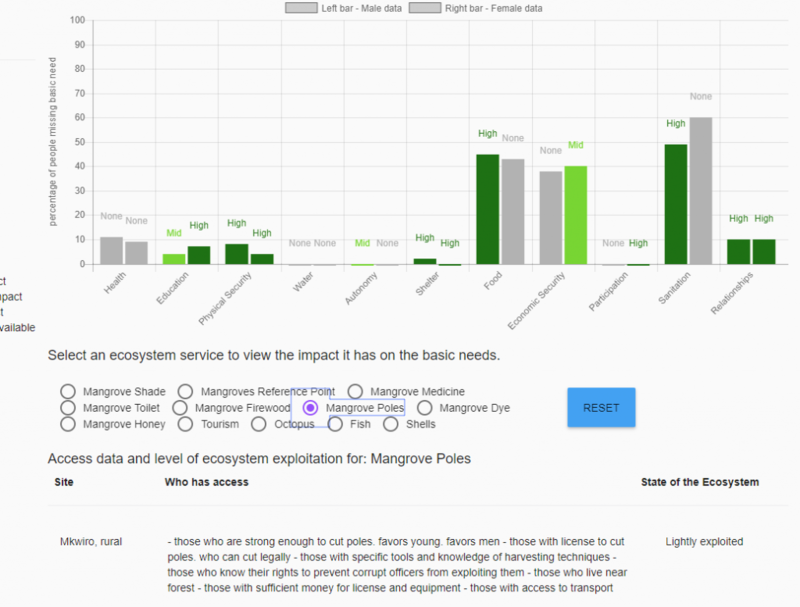 In the example below, we see that Mangrove Poles have a high impact on education (females), physical security (males & females), shelter (males & females), food (males), sanitation (males), relationship (males & females). Mangrove poles are used to build house therefore they have an impact on shelter, but they are also sold for money which is used to pay for school fees (education), food, and soap (sanitation). The practice of collecting and harvesting mangrove poles builds relationships. For more information on the connections between the ecosystem services and the impact on basic needs refer to the bottom of the information page on the Data Explorer. Below the chart, text information on who has access to the mangrove poles appears along with the state of the ecosystem. 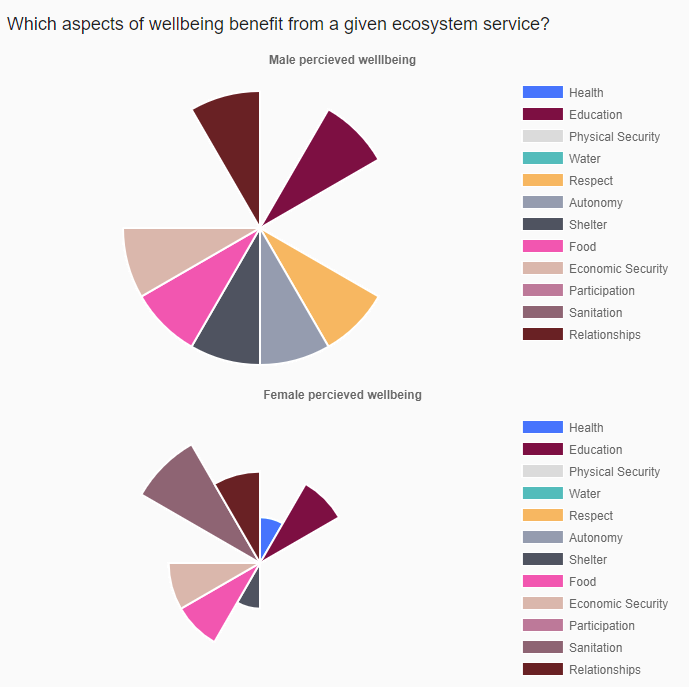 This chart shows how males and females perceive an ecosystem service to contribute to their wellbeing. This example shows how octopus is perceived to benefit males and females in Vamizi, Mozambique. Happy Exploring! Please email spaces.communication@gmail.com if you have any questions or feedback.